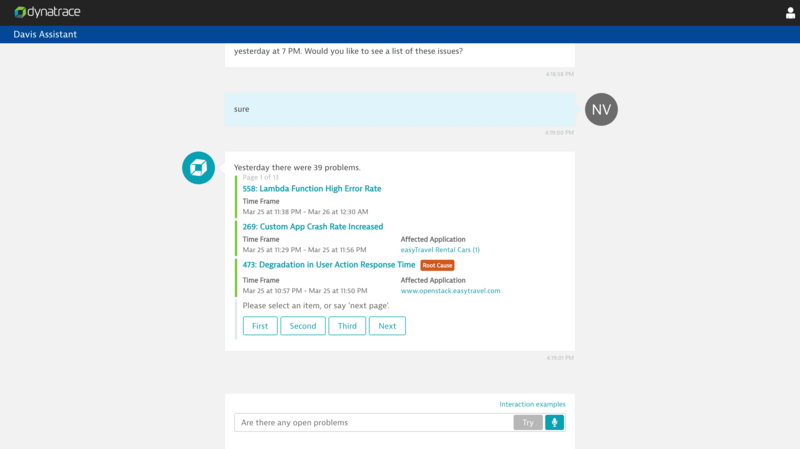 To access the Davis Assistant web application, navigate to davis.dynatrace.com and sign in using your Dynatrace SaaS or Dynatrace Managed account credentials. The text field at the bottom of the page includes a Try button. Use this button to send example requests to Davis Assistant and get a feel for how it works. Click Send to send typed questions. See the example below. Click the Microphone (next to Try) or tap the space bar to enable interaction with Davis Assistant using your voice or other audio responses (not supported in iOS due to auto-play restrictions). The Microphone turns red while Davis Assistant is listening. Click the Microphone button again to stop Davis Assistant from listening. Click the Microphone button while Davis Assistant is responding to stop playback and allow Davis Assistant to listen again. Double-clicking the Microphone button while a response is playing stops both response playback and listening. See the example below. For consistency across platforms, many of the responses offered by Davis Assistant feature interactive cards that appear and function similarly to their Slack counterparts. Click any links displayed in cards to open relevant Dynatrace pages. Buttons can be used to get more information about specific topics or to advance through result pages. As recent Davis Assistant interactions are stored locally in the browser, they won&apos;t appear when using other devices. You can clear your Davis Assistant interaction history, which is stored in your browser&apos;s local storage, by clicking Clear interaction history under the User Profile menu in the top-right corner of the Davis Assistant window.